It has been a warm and sunny weekend here in Portland. I have been mostly inside, working around the house, which had been neglected for too long. I was out today for a while, in the garden and it was so very lovely outside. In honor of a warm weekend I thought I would share these beach photos with you. I can't decide if this is the same group of friends. The photos are on different paper, so it makes me think, if they are the same group, that these were photos from two different people's cameras. The first one has the date on the back July 19, 1938. I was interested in the magazine that the young woman is reading. 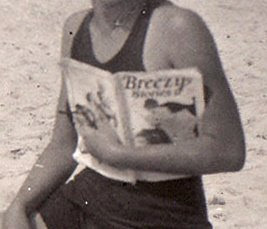 I looked it up and Breezy Stories was a pulp fiction magazine known for some racy covers. The thing is, though, is that that cover is not racy. This makes me think that the photo is not from the late 30's , however, the bathing suits look like the 1930's. So, it is a small mystery.